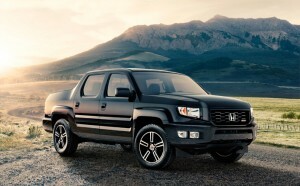 Comparing the 2013 Honda Ridgeline with the 2013 Chevrolet Silverado may seem a little like apples and oranges. After all, the Ridgeline doesn’t exactly fit into the pickup class. In fact, it doesn’t fit into any conventional class at all. Honda calls it a crossover utility vehicle, a mix between a pick-up and an SUV, and we call it one of the best choices for drivers on the move. And with that comes the best of both worlds. It’s worth comparing it to the Silverado because drivers interested in a pickup may find the Ridgeline is actually better for their needs. While the comparison is not clear cut, let’s explore why the Ridgeline offers more versatility than models like the 2013 Silverado and may be a better place to put your dollar. The Ridgeline begins at a lower starting price than the Silverado and offers much more in terms of comfort feature and a versatile drivetrain. While Chevy has focused on cramming as much muscle into the Silverado, Honda decided to go with a more lateral approach and develop a vehicle that could double as your work horse in the day and family carrier in the evening. That’s not to say that Honda brushed aside the power, though. Each Ridgeline is equipped with a tough 3.5L V6 engine with a power rating of 250 hp and 247 lb-ft of torque. That gives the Ridgeline enough power to carry 1,000 pounds of materials and equipment in the bed, and tow 5,000 pounds behind it. Where the Ridgeline really sticks out is its list of standard features, including a rearview camera and a limited slip, rear-locking differential. Neither of these features come standard on the Silverado. While some drivers are a bit skeptical when they see the Ridgeline’s bed, we ask you take a second look. The 5 foot length of the box gets close to what the Silverado Short Box has to offer, and with the lift gate lowered, bed length extends to 79 inches, longer than the Silverado Std. Box. Most importantly, the bed has enough room for 4×8 sheets of plywood to lay down comfortably. Heavy-duty tie downs also make securing your load an easy process. It also comes with a locking, in-bed trunk with 8.5 cubic feet of space. If you’re thinking the Chevy Silverado is the right car for your needs, then we encourage you to also consider the Honda Ridgeline. To take it for a test drive, we invite you to visit Middletown Honda. Located at 520 Route 211 in Middletown, Middletown Honda is only about five minutes from Mechanicstown by taking Schutt Road and NY-211 East.